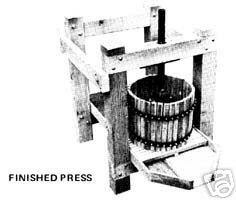 Nowadays, it's well nigh impossible to come by an old-fashioned barrel press. The very few that still exist are either quietly handed down from one generation to another within families or sold at outrageous prices in antique shops. Which means that if there's an apple orchard in your back pasture and you'd rather high-grade all that fallen fruit into cider than let the cows eat it, you'll have to break out the carpentry tools. My little cidermaker's ,winemaker not at all difficult to build. <?xml:namespace prefix = o ns = "urn:schemas-microsoft-com:office:office" />You will also receive receipe for making cider from scratch!